Most Americans – including majorities across demographic groups – say men and women are basically different when it comes to how they express their feelings (87%), their physical abilities (76%), their hobbies and personal interests (68%), and their approach to parenting (64%). In contrast, about six-in-ten Americans (63%) say men and women are basically similar when it comes to the things they are good at in the workplace. Among those who see gender differences across these various realms, there is no clear consensus about whether these differences are primarily rooted in biology or in societal expectations. The one exception relates to views about differences in physical abilities: 78% of those who say men and women are basically different in this area say this is mostly due to biology, while 21% point to different expectations society has for men and women. When it comes to the way men and women express their feelings, a majority of those who say there is a difference point to societal expectations (58%), but a substantial share (42%) say these differences are biological. And views are more evenly divided when it comes to gender differences on hobbies and personal interests (53% say they are based on societal expectations vs. 46% who point to biology), approach to parenting (52% vs. 47%) and the things men and women are good at in the workplace (53% vs. 47%). While majorities of men and women see gender differences when it comes to the way men and women approach parenting and how they express their feelings, there is a wide gap between the two groups in views of whether these differences are mostly based on biology or on different expectations society has for men and women. For example, two-thirds of women who say men and women are basically different in how they express their feelings – vs. 46% of men – say these differences are mostly based on societal expectations. And while 61% of women who see a gender difference in approaches to parenting say these differences are rooted in societal expectations, a similar share of men (58%) point to biology. 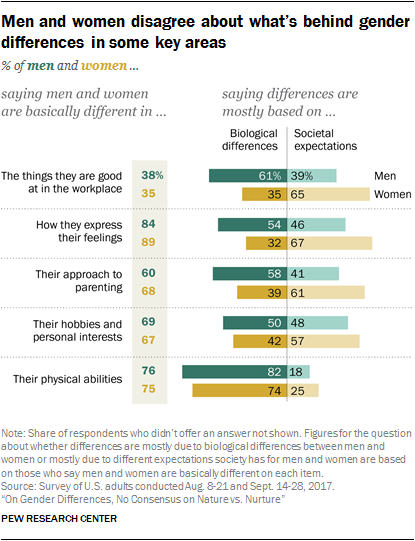 Men and women also offer different views on the roles of biology and societal expectations when it comes to gender differences in the workplace. Relatively small shares of men (38%) and women (35%) say there are differences when it comes to what each gender is good at in the workplace. 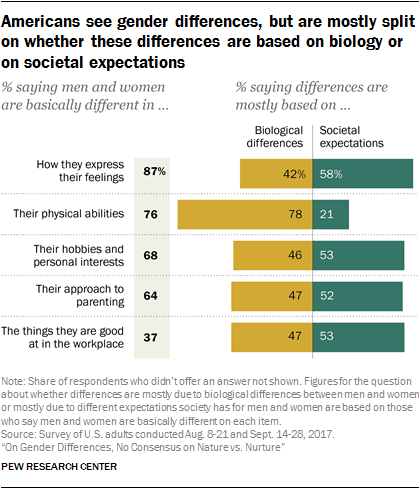 Among those who do see a difference, 65% of women say they are mostly based on different expectations society has for men and women, while 35% point to biology. In contrast, about six-in-ten men who see gender differences in the workplace (61%) say they are mostly biological. When it comes to gender differences on hobbies, personal interests and physical abilities, assessments of the roles biology and societal expectations play don’t vary as much between men and women. Among those who say men and women have different hobbies and personal interests, 57% of women and 48% of men say this is mostly based on different expectations society has for each gender, a difference that is not statistically significant. And among those who see gender differences in physical abilities, solid majorities of men and women point to biology (82% of men and 74% of women). Republicans and Republican-leaning independents are generally more likely than Democrats and those who lean Democratic to see differences between men and women, but more than half of each group say men and women are different in how they express their feelings (90% vs. 85%, respectively), their physical abilities (84% vs. 69%), their hobbies and personal interests (76% vs. 62%), and their approach to parenting (68% vs. 61%). 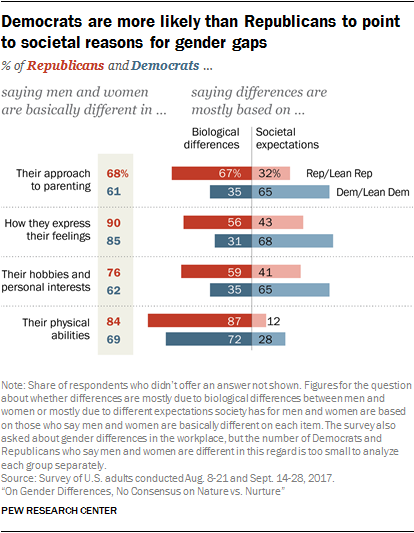 Democrats and Republicans who see gender differences across various realms offer widely different explanations for why men and women are different, with Democrats more often pointing to societal reasons and Republicans citing biology. About two-thirds of Democrats and Democratic-leaning independents who say men and women are basically different in how they express their feelings, their approach to parenting, and their hobbies and personal interests say these differences are mostly based on societal expectations for men and women. Among their Republican and Republican-leaning counterparts, 32% say differences in how men and women approach parenting are rooted in societal expectations, while about four-in-ten say the same about differences in how men and women express their feelings (43%) and in their hobbies and personal interests (41%). While most Republicans and Democrats who say men and women are different when it comes to their physical abilities say these differences are mostly biological, Democrats are about twice as likely as Republicans to say they are based on the expectations society has for men and women (28% vs. 12%). The public doesn’t necessarily see a problem with the notion that men and women are different. In fact, many who say there are differences between men and women say this is a good thing, particularly when it comes to differences in parenting (56% say it’s a good thing that men and women have different approaches) and in the things they are good at in the workplace (48%). About a third of those who see gender differences in physical abilities (35%) or hobbies and personal interests (33%) say it’s a good thing that men and women are different in these areas, while about six-in-ten say it doesn’t matter. Opinions are somewhat more varied among those who say men and women are different in how they express their feelings. About a third in this group (32%) see this as a good thing and 24% say it is a bad thing; 44% say it doesn’t matter. Women who see a gender difference in how people express their feelings are about three times as likely as men to say this is a bad thing (34% vs. 11%, respectively). For their part, men are more likely than women to say it’s a good thing that men and women are different in this regard (43% of men say this, vs. 23% of women). People who say gender differences are driven by biology are generally more likely than those who point to society to say it’s a good thing that men and women are different. Still, for the most part, relatively few among those who say gender differences are rooted in societal expectations think this is a bad thing. For example, when it comes to gender differences in approaches to parenting, 72% of those who say these differences are based on biology say it’s a good thing that men and women are different in this regard; among those who say these differences are driven mostly by societal expectations, 41% say it’s a good thing that men and women are different in their approaches to parenting, 40% say it doesn’t matter and 19% say it’s a bad thing. Even as most of the public sees differences between men and women across various realms, there is a sense among many Americans that society should be more accepting of men and women taking on roles that are traditionally associated with the opposite gender. About half of Americans (49%) say society isn’t accepting enough of women taking on roles that are typically associated with men, while 36% say society is about right and 14% say it is too accepting of women doing this. Similarly, 46% say society is not accepting enough of men taking on roles that are typically associated with women; 39% say it is about right and 14% say it is too accepting. Views about gender roles vary considerably by gender and party identification. Among women, 58% say society isn’t accepting enough of women taking on roles typically associated with men, while slightly fewer (53%) say the same about society’s position on men taking on traditionally female roles. Smaller shares of men say society should be more accepting of women (39%) and men (38%) taking on roles typically associated with the other gender. Democrats and Democratic-leaning independents are about twice as likely as Republicans and those who lean to the GOP to say society should be more accepting of women and men taking on roles typically associated with the opposite gender. At least six-in-ten Democrats say society should be more accepting of men (60%) and women (66%) doing this, compared with about three-in-ten Republicans. While about half of white, black and Hispanic adults say society should be more accepting of men taking on roles typically associated with women, blacks and Hispanics are more likely than whites to say society is too accepting of this: About a quarter of blacks (24%) and 17% of Hispanics say this, compared with 11% of whites. There are no significant differences in the shares of blacks, whites and Hispanics saying society is too accepting or not accepting enough of women taking on roles typically associated with men.